John Storgårds and the Helsinki Philharmonic are exceptionally responsive partners in this vivid recording. They draw out all the evocative colours from Shostakovich's orchestration (...). The Cadenza is expertly handled, Tetzlaff negotiating the difficult transitions in tempo with complete conviction and technical brilliance. Tetzlaff's stoicism, clarity of vision and architectural mastery pay even greater dividends in the more emotionally elusive Second Concerto. The longish first movement can sometimes sound discursive and lacking in direction. Yet Tetzlaff and Storgårds keep a tight grip on proceedings, building inexorably to a frenzied climax in the middle section. Ondine's successful partnership with violinist Christian Tetzlaff continues with a new release. The new recording contains the two Violin Concertos by Dmitri Shostakovich (1906-1975), two powerful works by the composer originally written for David Oistrakh. Christian Tetzlaff has been considered as one of the world's leading international violinists for many years, and still maintains a most extensive performing schedule. Musical America named him "Instrumentalist of the Year" in 2005 and his recording of the violin concertos by Mendelssohn and Schumann, released on Ondine in 2011 (ODE 1195-2), received the "Preis der deutschen Schallplattenkritik". Tetzlaff's recording of the Mozart Violin Sonatas (ODE 1204-2) was chosen Gramophone Magazine's Editor's Choice and Recording of the Month by the BBC Music Magazine. 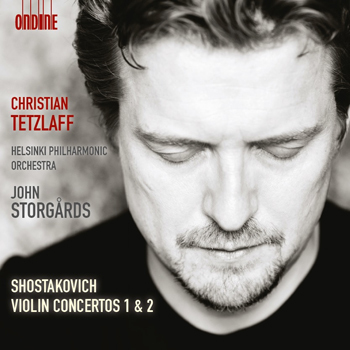 Tetzlaff's previous release on Ondine featuring the Schumann Violin Sonatas (ODE 1205-2) was also chosen Disc of the Month by the Gramophone Magazine. The two Violin Concertos by Shostakovich, written in the 1940s and 60s, belong to the composer's most powerful and most personal works, yet they are very much different from each other. Shostakovich's Violin Concerto No. 1 was written during a wave of Anti-Semitism in Soviet Union and premiered only after Stalin's death. Violin Concerto No. 2 is a grand example of Shostakovich's late period including quotes from Shostakovich's earlier works. David Oistrakh described the concertos: "I have played Shostakovich's magnificent Violin Concertos in many countries with the greatest pleasure. But they really are very different from one another: I would be hard put to find anything that they have musically in common."